Learn how to load data for campaigns. From this point forward, the campaign structure is in place for dashboards. It's only a matter of loading current data on a daily basis and managing campaigns as you build more. This document will provide instruction to your IT resource team on how to send data via the private PlayVox API. Once a performance campaign is built, Go to the main Campaign dashboard. Click on the Actions button to the far right for the Campaign you wish to receive data. And click on the 'How to send data' option. 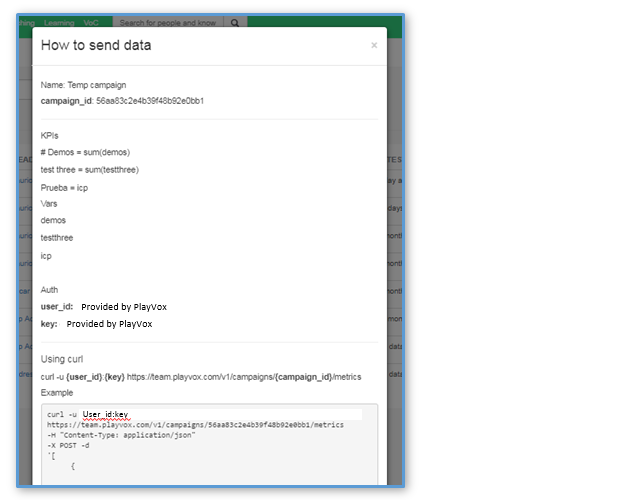 Once the API is activated, data for a specific campaign will be pushed to the PlayVox platform and reflected in agent, team leader, and manager dashboards. Congratulations! You've completed the five steps to building your performance campaign. You are now a master campaign builder!